Donuts are one of my favorite things to indulge in and its been a while since I made a batch. What I love about making donuts at home is that most recipes make only 6 and they’re easy to customize. These sour cream donuts are light and fluffy. Nothing like a traditional cake donut. They had a hint of tartness from the sour cream and had the perfect amount of sweetness from the glaze. In less than 30 minutes, you can easily whip up a batch of these donuts. I hope you all had a great Valentine’s Day and are ready for a little more sweetness! It’s time for the Secret Recipe Club and I did a little baking for my kids. They’ve been begging me for donuts lately and while going through my assignment for this month’s SRC, I decided to go with Lauren’s recipe for donuts. Lauren pens the blog, Sew You Can Cook. Seriously, such a fun name for a blog! Lauren is a SAHM to 2 adorable little boys and has dreams of one day becoming a caterer. You’ll get there Lauren, you’re so talented! This recipe is so quick and easy! I made it twice in the last week…the first time I didn’t grease my donut pan well and the donuts stuck. We still enjoyed them! I loved the subtle flavor of the olive oil…yes, they use olive oil! Lauren made them as a part of the #EVOOChallenge and I loved checking out all the other recipes that she made as part of the challenge. I followed her recipe closely, just swapped out the dark chocolate chips for mini chocolate chips, added a splash of vanilla extract and a little dried vanilla beans. They came out great the second time and my kids are going to enjoy them for breakfast this morning. Preheat oven to 375 degrees. Generously spray a donut pan with nonstick cooking spray and set aside. In a medium bowl, whisk together the flour, sugar, baking powder and salt. Mix in the chocolate chips to coat them to help them from sinking to the bottom of the donuts. In a large bowl, whisk together the eggs, vanilla extract, olive oil and milk. Add in the dry ingredients and mix until just combined. Divide the batter between the six donuts. Bake for 10 to 15 minutes or until a toothpick comes out clean. The muffins will be a light brown on top and darker on the bottoms. Allow to cool before removing from the donut pan. Check out all the other great recipes from this month’s reveal in the link below! It’s Fall!!! My favorite time of the year – crisp air, sweaters, boots, pumpkin, apples, snuggling – there’s just so much I love. I can’t wait to go apple picking (lots of recipes I want to make) and take the kids to the pumpkin patch. The leaves are starting to change color and it’s just been perfect weather. We’ve had a busy couple of weeks and since we haven’t had a chance to go apple picking, I picked up a half dozen of apples at our local orchard’s farm stand. I was in the mood to bake something the other night since it was a rainy, gray day…I find days like that are really when I want to spend time in the kitchen. 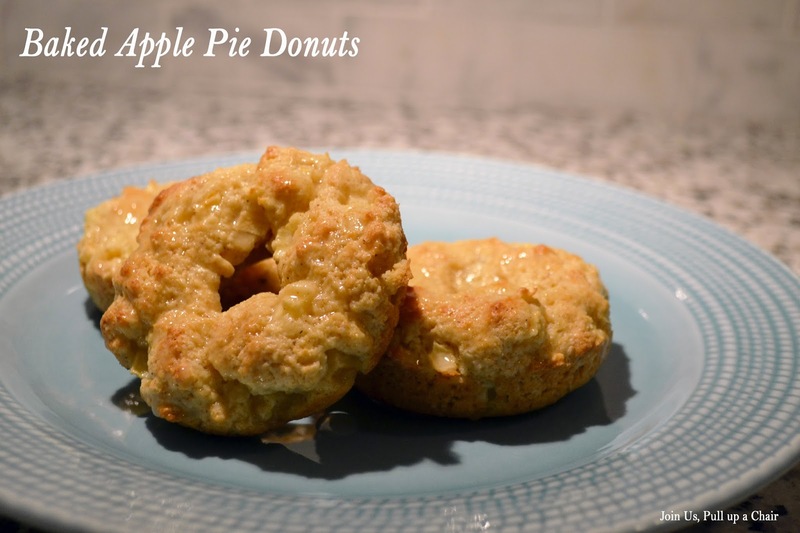 I’ve been craving donuts lately, so baked apple pie donuts are what I decided on. They were super easy to make. I had Madeline take care of mixing everything while I peeled and diced an apple. The original recipe called for them to be dipped in cinnamon-sugar but I decided on drizzling apple cider glaze over them. My glaze was a little thin, but it gave them a little more apple flavor. I’m planning to try them again and swapping out the AP flour for whole wheat flour and apple cider for the milk and adding cinnamon to the dry mixture. Preheat oven to 350 degrees. Lightly spray a donut pan with nonstick cooking spray and set aside. In a medium bowl, combine both sugars, flour, baking powder, salt, and nutmeg. Cut in the cold butter with a pastry knife. In a small bowl, mix the egg and milk together. Pour into the dry mixture and add in the diced apple. Stir until mixture becomes a dough. Place 2 spoonfuls of dough into each of the donut molds in the pan. Bake for 15 to 20 minutes or until the donuts are golden brown. Allow to cool in pan for 5 minutes and then remove to a cooling rack to completely cool. Once cooled, stir together apple cider and powdered sugar to make a glaze. Drizzle over the cooled donuts and enjoy!